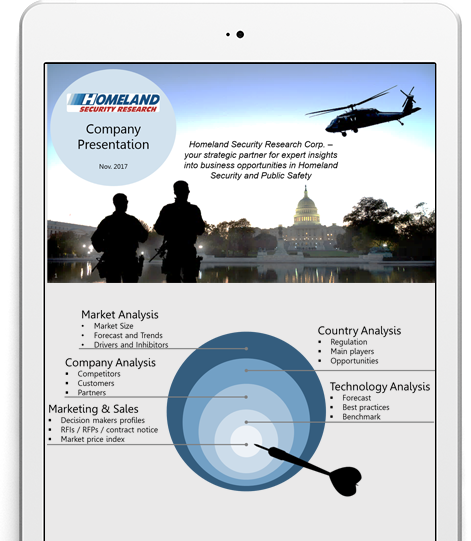 By its very nature, the Homeland Security industry is highly dynamic. You must have the latest knowledge of emerging business opportunities that result from new legislation, increased competition and change of leadership that could translate into key go or no-go business decisions. At HSRC we provide you with a dedicated engagement team to be at your side, monitoring your business and those areas in the Homeland Security and Public Safety market that directly affect you. We are on call when and where you need us, answering your questions, highlighting less obvious drivers and inhibitors along your business track, and alerting you of any new developments that could have direct impact on your core business. Think of us as your own in-house competitive intelligence unit, someone who knows you, and has an in depth understanding of the Homeland Security market in general and your needs in specific. Our customized reports are tailored specifically to your market research needs and information gaps. Have specific information gaps? Working on a new go-to market strategy? Trying to better understand your market? Looking for new business opportunities? Contact our team today for a custom-made report! HSRC customized reports and industry insights department supports your operations throughout the entire business cycle with personalized reports according to your needs, focusing on specific information gaps. The customized research services provide a deep analysis of specific markets and eco-systems, target geographies, strategic segments and verticals, competitor analysis and technological benchmarks. These reports are designed according to our clients’ requirements for a variety of areas, including: business development, M&A, product design, strategic planning, preparing PR campaigns, penetrating a new market or geography, or simply gain a better understanding of the market dynamics.